Born in Pennsylvania in 1836, George Stein Isett was the son of Pennsylvania native Henry Isett (born sometime around 1795). In 1850, George lived alone with his father, a 55-year-old carpenter, in Liverpool, Perry County, Pennsylvania. In 1861, at the dawn of the Civil War, George Isett was in his mid-20s, employed as a boatman, and still residing in Liverpool. On 20 August 1861, at the age of 25, George S. Isett enrolled for military service at Bloomfield, Perry County, Pennsylvania. He then mustered in at Camp Curtin in Harrisburg, Dauphin County on 31 August 1861 as a Private with Company D of the newly formed 47th Regiment, Pennsylvania Volunteer Infantry. The commanding officer of his company was Captain Henry Durant (“H. D.”) Woodruff. 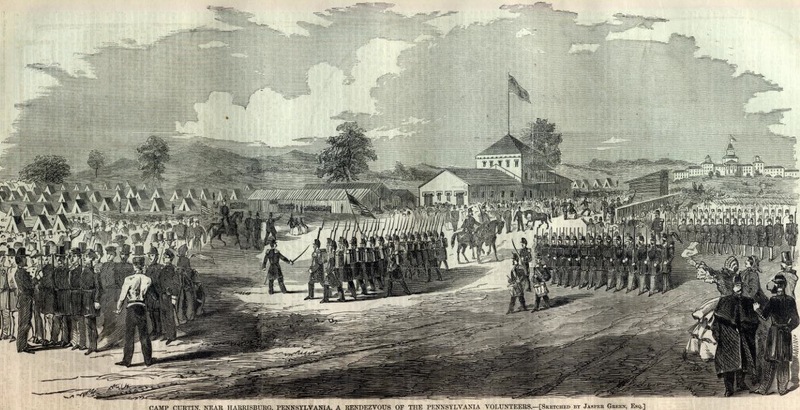 As a unit of the 47th Pennsylvania Volunteers, Company D became part of the federal service when the regiment officially mustered into the U.S. Army on 24 September. On 27 September, a rainy, drill-free day which permitted many of the men to read or write letters home, the 47th Pennsylvania Volunteers were assigned to the 3rd Brigade of W.F. Smith’s Army of the Potomac. That afternoon, they marched to the Potomac River’s eastern side and, after reaching Maryland’s Camp Lyon, marched double-quick over a chain bridge before moving on toward Fall Church, Virginia. Arriving at Camp Advance at dusk, they pitched their tents in a deep ravine about two miles from the bridge they had just crossed, near a new federal military facility under construction (Fort Ethan Allen). Armed with Mississippi rifles supplied by the great Keystone State, they joined with the 3rd Brigade and Smith’s Army of the Potomac in defending the nation’s capital. As a reward for their performance that day – and in preparation for the even bigger events which were yet to come, Brigadier-General Brannan directed his subordinates to ensure that brand new Springfield rifles would be purchased for every member of the 47th Pennsylvania Volunteers. Ordered to move from their Virginia encampment back to Maryland, the 47th Pennsylvania Volunteers left Camp Griffin at 8:30 a.m. on Wednesday, 22 January 1862, marching through deep mud with their equipment for three miles in order to reach the railroad station at Falls Church. Sent by rail to Alexandria, they then sailed the Potomac via the steamship City of Richmond to the Washington Arsenal, where they were reequipped before they were marched off for dinner and rest at the Soldiers’ Retreat in Washington, D.C. The next afternoon, the 47th Pennsylvanians hopped railcars on the Baltimore & Ohio Railroad, and headed for Annapolis, Maryland. Arriving around 10 p.m., they were assigned quarters in barracks at the Naval Academy. They then spent that Friday through Monday (24-27 January 1862) loading their equipment and other supplies onto the steamship Oriental. 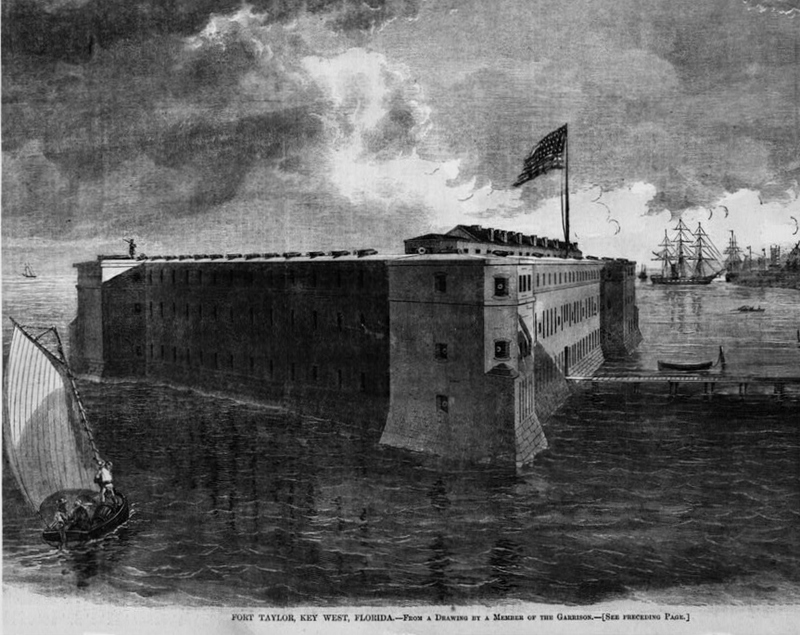 In early February 1862, Private George S. Isett and his fellow 47th Pennsylvania Volunteers arrived in Key West, where they were assigned to garrison Fort Taylor. On 14 February, the regiment made itself known to area residents via a parade through the city’s streets. Drilled daily in heavy artillery tactics, the soldiers of the 47th also cut trees, built roads and strengthened the installation’s fortifications. The work was frequently unpleasant, the weather often harsh – with at least several men suffering from sunstroke so severe that they were hospitalized before being discharged on Surgeons’ Certificates of Disability. The men of the 47th also battled yellow fever, typhoid and other tropical diseases for which their immune systems had no fortitude, as well as dysentery and other chronic conditions common to soldiers confined to close, often unsanitary quarters. Sometime during this phase, Private George S. Isett became one of those who fell ill. On 17 May 1862, he died from acute dysentery at the post hospital at Fort Taylor, Key West, Florida. Pvt. Isett was buried in Grave #14 of the Key West Post Cemetery, and when the cemetery was abandoned in 1927 and the burials transferred to Fort Barrancas National Cemetery, his remains were mishandled and his body was buried in a group of 228 unknown graves. RESOLVED, hat by his death we have lost a warm hearted friend, a true patriot and good soldier, and one whose placed cannot be filled among us. RESOLVED, That we most heartily sympathize with the deceased and hope that he who has thus afflicted them, will be their reliance in time of need. Signed: George W. Topley, Jesse Meadith, Jacob Charles, George W. Jury, Isaac Baldwin, Committee. In addition, an online memorial for Private George S. Isett has been created at Find A Grave. 3. Registers of Deaths of Volunteers, in U.S. Adjutant General’s Office (Record Group 94). Washington, D.C.: U.S. National Archives, 1862.